The last time Fred DuVal and Doug Ducey discussed K-12 education and the long-running lawsuit over school funding, the two were trading barbs during the debates of the rancorous 2014 gubernatorial race. Now, the two are standing side by side to promote Proposition 123, a proposal that would end years of litigation and pump billions of dollars into K-12 schools. DuVal, the Democratic nominee who lost to Ducey in 2014, publicly declared his support on Wednesday for Prop. 123, while the campaign for the ballot measure unveiled an ad featuring the former rivals. 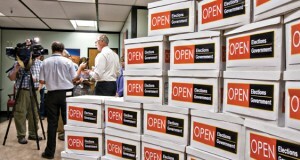 The announcement was timed to coincide with the mailing of early ballots for the May 17 special election. In the ad, titled The Odd Couple, Ducey and DuVal say that though they ran against each other and disagree on many issues, they both support Prop. 123. DuVal emphasizes that the measure puts $3.5 billion into classrooms over the next decade and is a “great first step to improve Arizona’s education,” while Ducey notes that it helps teachers without raising taxes. As he did often during his 2014 campaign, DuVal said he comes from a tradition of putting bipartisanship aside to tackle important issues. 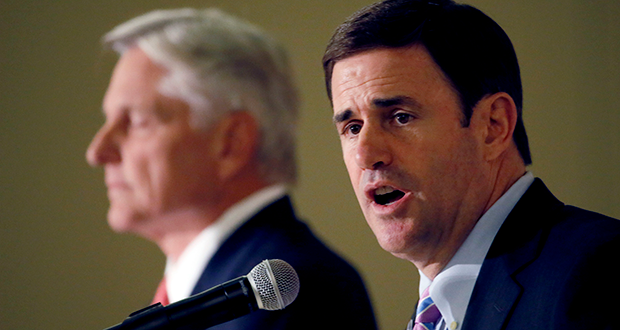 Ducey said it felt natural to reach out to DuVal for help with the campaign. “I thought this was a very important issue, and I know what Fred can bring to this debate and to this discussion. And I’m thrilled that he’s part of this,” the governor said. What DuVal may be able to bring to the table is support from reluctant Democrats, some of whom oppose Prop. 123 as too great a concession following years of litigation over the underfunding of K-12 schools. DuVal joins a growing list of Democrats who have jumped on board with the proposal. They include Phoenix Mayor Greg Stanton and a handful of Democratic lawmakers, all of whom voted against the measure during an October 2015 special session. DuVal acknowledged that the plan isn’t what he would have proposed if he’d been elected governor, or what Democratic lawmakers would have passed if they were in control of the Legislature. DuVal said Democratic critics should recognize that Prop. 123 is a compromise. “Show me 31 and 16 for something different. Show me a ballot issue that can pass. Show me a litigation strategy that will force the Legislature to do more. You can’t. This is the opportunity. This is the plan,” he said. DuVal, a longtime Democratic operative, Clinton White House staffer and Arizona Board of Regents chairman, said he’s supporting Prop. 123 for three primary reasons: the money it provides to schools, the certainty it provides to teachers who haven’t had a raise in years, and the end it will bring to the litigation that began with deep funding cuts in 2009. “Teachers are magnificent, open-hearted people who really want to do the right thing. And many of them are willing to put up with a bad salary. What they can’t put up with is the uncertainty of knowing from year to year what the future holds. This creates some certainty,” he said. Prop. 123 taps into the state’s Permanent Land Endowment Trust Fund, which contains the proceeds from the sales of state trust land, to boost K-12 funding over the course of 10 years. That new funding would be included in the base funding for K-12 schools, which is the figure the state uses to determine how much schools’ inflation-based budget increases will be from year to year. The measure also includes “triggers” that allow funding increases to be frozen if it reaches 49 percent of the state’s budget, or even reversed if K-12 funding reaches 50 percent. The campaign for Prop. 123 has raised more than $4 million. The opposition campaign has reported less than $1,000 in funding.